Community health workers (CHWs) provide peer support through health education, promotion, advocacy and in some cases, service provision due to their unique ability to bridge the gap between their respective communities and health care services. (Click here to see CHW definition). Public Health-Seattle & King County (PHSKC) has utilized CHWs to support chronic disease self-management among low-income ethnically diverse families since 1994. With 14 years of extensive work focused on asthma and diabetes, PHSKC has developed core approaches applicable to both areas, which can also be helpful for programs that use CHWs to improve outcomes of any chronic condition. The PHSKC CHWs use the model of chronic care self-management which acknowledges common elements of disease management (such as understanding and coping with disease), developing self-management skills, communicating effectively with the health care team, coping with stress, developing social support and utilizing community and health system resources. Specifically, CHWs provide home visits to identify barriers to disease management, assess home environmental and social conditions, assist participants in making disease self-management behavior changes, facilitate communication with health care providers and provide links to varied resources such as low-cost or free medication, link-ups to health care and home remediation services. In the PHSKC programs, CHWs speak the languages of the community they serve (English, Spanish and Vietnamese), and are recognized by study participants as being “of their community” because they share values, traditions and practices. They translate the advice from medical professionals about “what needs to be done” regarding disease management into the “how it can be done” that fits with the client’s traditions and practices. Using motivational interviewing to identify changes the client is most ready to make and setting achievable and incremental goals toward disease management is a successful combination. PHSKC has devoted tremendous effort into developing tools for community health workers programs such as guidelines addressing when to ask for help and advice and how to communicate with health care providers, and CHW training materials (e.g., motivational interviewing techniques). More resources can be found at Tools for Community Health programs and Community Health Worker (CHW) Training under HomeBASE tools and documents on the PHSKC website. Through grant-funded programs from National Institutes of Health, Robert Wood Johnson Foundation and Centers for Disease Control and Prevention (CDC), over 2,000 people with asthma or diabetes have completed the PHSKC programs. Evaluation data from their Healthy Homes I &II randomized controlled trials with a diverse pediatric population with asthma, showed that focused CHW home visits significantly reduced urgent care visits, improved caregiver quality of life and increased symptom-free days. 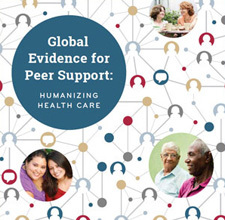 The testimonials from participants reinforce the benefits of peer support demonstrated by their programs and, in particular, the influence CHWs have had in motivating behavior change in clients. Due to the model’s success, PHSKC has received a new translational grant from CDC, which is measuring the ability to implement this research-proven approach into community clinic settings and describe its cost effectiveness.